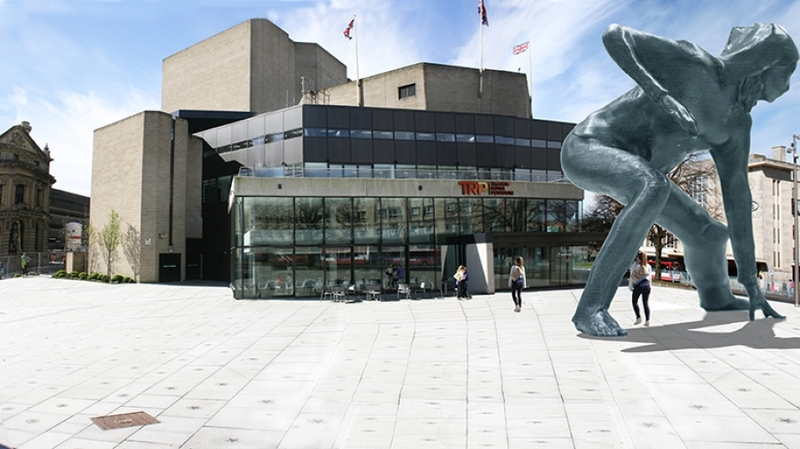 Plans for a giant bronze sculpture for outside the Theatre Royal Plymouth have been given the green light. Councillors at Plymouth City Council this afternoon unanimously approved the scheme saying it would be an ‘exciting’, ‘vibrant’ and ‘visual addition’ to the city centre. Work will now begin to bring the towering figurine to life. She will stand seven-metre (23ft) tall and measure nine-metre (30ft) wide and could be in place by 2018. Among the Councillors debating the plans in the council chamber today was Cllr Tina Tuohy (Lab). She said: “I am not one of those women who feels demeaned by this statue. I think it is very impressive. Pieces of art like this are for the community, live among the community, and should be allowed to stay like that. Speaking at the meeting, Chief Executive of the Theatre Royal Plymouth, Adrian Vinken OBE, said that Bianca would signal change for Plymouth. He said that the city was steeped in history and was one of great global influence, and still was with plans for the Mayflower 400 plans in the future. Adrian added: “In 2020 Plymouth will have a once in a lifetime opportunity to transform how this city is perceived nationally and internationally and we must get maximum benefit from that opportunity. Theatre bosses hope the sculpture will create a unique and iconic landmark for the city, similar to that of Gateshead’s Angel of The North and Damien Hirst’s Verity in Ilfracombe. After plans were approved, Mr Vinken said: “We are delighted that Plymouth City Council shares our vision for this imaginative piece of public art and look forward to the challenge of bringing it to fruition over the next couple of years. The sculpture will be so tall that visitors will walk under it to gain access to the Theatre’s main lobby. Cornish-born artist Joseph Hillier will begin work on creating the statue now that the scheme has received council backing. Mr Vinken said: “Joseph will start by carving a full size version of the figure from which a mold will be taken. This will then be used by the foundry to cast the bronze statue. “We hope to create an online facility whereby people can monitor progress as Joseph creates the statue in his studio. The sculpture is inspired by the character ‘Bianca’ from an explosive and award-winning version of Othello performed in 2008 by Frantic Assembly, a theatrical company which has a 20-year-long association with the Theatre Royal Plymouth. The sculpture will cost around £450,000 to create. The money will come entirely from a pot of cash specifically earmarked for a piece of public art as part of the theatre’s 2013 Regeneration Project. The sculpture proposal has received a mixed response since it was first revealed in October, but Mr Vinken said that was the good thing about art. He said: “Any piece of public art worth its salt ought to be controversial, ought to divide opinion. “We recognise that this may have divided opinion but hope that, once people see the finished piece, over time they will come to love it just like with The Angel of the North. The vast majority of the public was initially against the idea of The Angel, but it is now universally loved and has created a great sense of local pride.